We’re delighted to announce that a number of high profile programmes led by or involving members of the West of England Patient Safety Collaborative are in the running for the HSJ Patient Safety Awards 2017. The winners will be announced at the Patient Safety Congress on 4 July 2017 in Manchester. The initiative to support the adoption and spread of the ED safety checklist across all trusts in the region has been shortlisted for an HSJ Patient Safety Award in the ‘Best Patient Safety Initiative in A&E’. The checklist was piloted at University Hospitals Bristol NHS Foundation Trust in 2014 with demonstrable success in improvements in patient safety. This tool is now being used by all trusts in the West of England (all seven EDs across six trusts as well as the ambulance service), addressing the shared challenge of ensuring patient safety during periods of crowding. A significant achievement has been the improvement in patient triage as evidenced by the average number of major/trauma patients with a National Early Warning Score (NEWS) calculated at triage – up from 55% to 84% in the first four months of the programme. 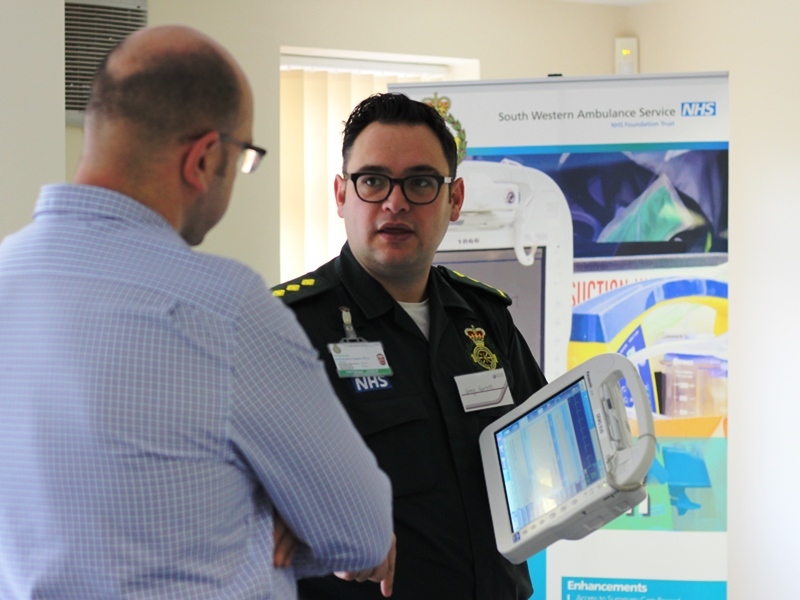 Our work to support the South Western Ambulance Service’s Electronic Patient Care Record & National Early Warning Score (NEWS) has been shortlisted in the ‘Information Technology to Improve Patient Safety’ category. We collaborated with the Ambulance Service to build NEWS into its electronic Patient Care Record (ePCR), automating this functionality when clinical observations are taken. This ensures all acutely unwell patients have their NEWS calculated so they are treated in the most clinically appropriate manner. In addition this supports appropriate clinical prioritisation and early detection of sepsis. Currently 75% of all patient ePCRs across the trust’s patch contain a NEWS score. NEWS is prominently displayed on the clinical workstation (CWS) allowing the clinician to better manage workflow and improve the quality of pre-hospital care. The Emergency Laparotomy Collaborative is a finalist in the ‘Patient Safety in Surgical Care’ category. This is a two-year quality improvement project funded by the Health Foundation, which brings together three Academic Health Science Networks (West of England, Kent Surrey & Sussex, and Wessex) who are working with 24 NHS Trusts comprising of 28 hospitals in these three regions. The aim of the Collaborative is to improve standards of care and outcomes for patients undergoing emergency laparotomy. The ELC has grown from the successful Emergency Laparotomy Pathway Quality Improvement Care bundle project (ELPQuiC) carried out three years ago in four hospitals in the South of England. Over an eight-month period, crude 30-day mortality was reduced by 25% and P-POSSUM risk adjusted 30-day mortality by 42%. All six acute trusts in the West of England will adopt this evidence-based practice as part of the collaborative pathway. ‘Tea trolley’ training programme: a novel approach to multidisciplinary training in the workplace (Education and Training). And finally congratulations also go out to colleagues at Gloucestershire Care Services Trust whose work on implementing NEWS in nursing homes has earned them a finalist spot in the ‘Patient Safety’ in the Community category. Well done to everyone involved in all of these important patient safety programmes. We’ve been told that the judges had a tough job scoring this year and have commended the high quality of entries – so to be shortlisted is a fantastic achievement! See the full shortlist here. Find out more about the work of the West of England Patient Safety Collaborative here, including our main programmes focussing on The Deteriorating Patient (including NEWS, Emergency Laparotomy Collaborative and the ED Safety Checklist) and Collaborating in the Community.